This is a shocking and compelling new YA series from debut author, Amy Ewing. The Handmaid’s Tale meets The Other Boleyn Girl in a world where beauty and brutality collide. Violet Lasting is no longer a human being. Tomorrow she becomes Lot 197, auctioned to the highest royal bidder in the Jewel of the Lone City. Tomorrow she becomes the Surrogate of the House of the Lake, her sole purpose to produce a healthy heir for the Duchess. Imprisoned in the opulent cage of the palace, Violet learns the brutal ways of the Jewel, where the royal women compete to secure their bloodline and the surrogates are treated as disposable commodities. Destined to carry the child of a woman she despises, Violet enters a living death of captivity - until she sets eyes on Ash Lockwood, the royal Companion. Compelled towards each other by a reckless, clandestine passion, Violet and Ash dance like puppets in a deadly game of court politics, until they become each other’s jeopardy - and salvation. It will appeal to fans of dystopian, dark romance, stepping beyond the paranormal craze. It is perfect for fans of Allie Condie and The Hunger Games. It is a debut novel from a radical new voice in YA. It is the first book in The Jewel trilogy. This book took me by surprise. My instinct is usually to pass on anything with an elaborate dress on the front cover, but this was thoroughly entertaining melodrama. The premise has a hint of The Handmaid’s Tale: girls born with a genetic mutation are taken from their families and institutionalised, trained to be surrogates for the extremely wealthy women who live in an area known as the Jewel. 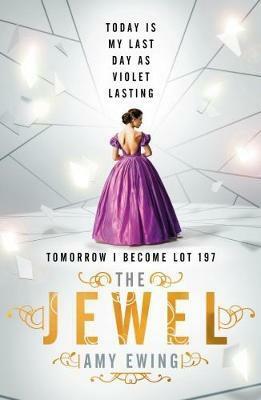 From here we follow the story of Violet, one of 200 girls being sold at auction, who is bought by a Duchess with severe motives and a cruel streak. Violet is likeable and not too prissy. Sometimes she’s seduced by the luxury of her prison, but mostly she’s down-to-earth, terrified of the prospect of carrying a child, and yearning for a normal existence: love, friendship and, most of all, the freedom to choose her own destiny. The world-building is fairly light and there may be cries of ‘insta-love’ over the romance, but I found this to be a diverting soap opera.